As newcomers to the America’s Cup arena, Artemis Racing suffered more than just growing pains in its AC34 debut. 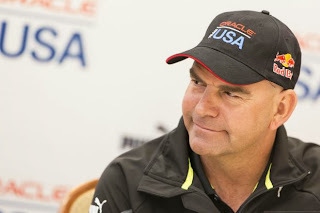 Following the tragic death of Andrew Simpson in an unfortunate training incident, it was highly doubtful that the team would regroup both emotionally and physically to sail again, but against all odds they did, competing in four races against Luna Rossa in the Louis Vuitton Cup semifinals. 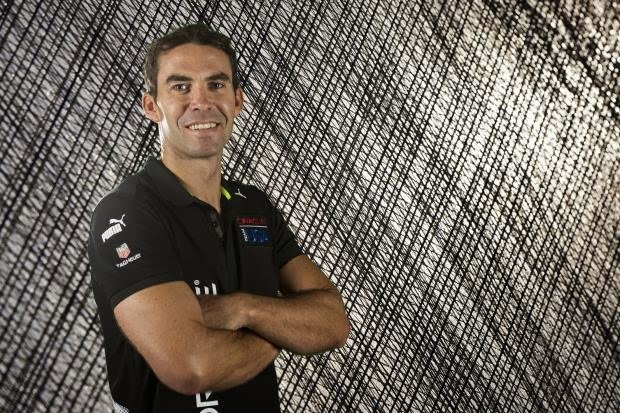 Although he’s adamant that it’s been a relentless team effort that got the team back on the water, it’s clear that Artemis Racing skipper Iain Percy, long-time Olympic sailing partner and close friend of Simpson, was a motivating force behind this massive achievement. Here Percy talks about the end of an era, and perhaps surprisingly, the beginning of a new one. What’s the break down procedure after an AC campaign ends?IP: One of the unique aspects of the America’s Cup is that the winner decides the next competition. It’s sometimes one of the frustrations and sometimes described as one of the unique beauties of the Cup. Certainly from a planning perspective, it's one of the frustrations. I think it's pretty normal for teams to stop after a Cup, and personally I think it's very important that a team takes a break to regroup before very carefully reforming. That’s what Artemis Racing is doing. Torbjörn, at our final press conference, very clearly stated his passion to do the next Cup. We don’t want to repeat mistakes by jumping in without proper thought and proper vision. So, we’ve stopped and we’re packing up. What happens from a practical standpoint? IP: We have a lot of things of value that need to be maintained and put away properly. We have a small squad remaining at our base in Alameda packing up and putting equipment into containers, including things like machine shops that can be reopened at any moment in the future. It’s a 100-person organization so there’s a lot of personal gear that needs to be go back to where people want it to go. It’s a huge logistical challenge. There’s also a lot of work to be done in taking an audit and doing a genuine inventory of all our equipment and IP gear. It’s really not much more magical than that. Who is still on the payroll, and who has finished up? IP: There’s a small squad of people here putting things in containers. There’s an area of the organization that needs to keep going, like answering to the press etc. Nathan [Outteridge] and I are still here because we’re passionate about the Cup and Artemis Racing. It’s not for me to announce who is still with the team, that will come at the appropriate moment. I think anyone who knows Torbjörn knows that he’s incredibly serious about what he wants for Artemis Racing, and I think they also know that Artemis Racing has proved to be a very enjoyable place to work. I think when you see the people who are keen to stay involved, it’s pretty clear it’s going to be a dominant force in the America’s Cup. I think the key message is the reason that you’re speaking to myself and Nathan—is because we really do believe that this team can be special. 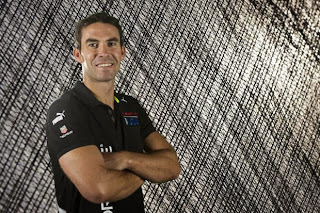 So you’re keen to stay on with Artemis Racing? IP: Yes, absolutely. I see what I think everyone else around the sailing community sees—that Torbjörn is passionate about the Cup, about winning, that he’s incredibly in touch with the team. He’s very much a leader and a guider of the team in a positive sense. That for me is a huge motivation. I’ve done this game for a little while now, and I’m less naïve than I used to be. So I know that when these things are done properly, they can be incredibly enjoyable, good places to work with good people in a fun collegiate environment where we can exercise the passion for the technology of our sport. If done wrong, it can be quite difficult. For me Torbjörn stands out as someone able to do something properly. What’s happening with the Artemis Racing boat?IP: [Laughs] It reminds me that after our last day sailing, one of the crew said to me, “This may actually be the last time this boat sails!” As history goes, that may well be the case. In a way it’s a shame with the Cup, particularly with this Cup and the last Dog Match, that they’re not the kind of boats you go out for an afternoon sail with a few mates, that’s for sure. It requires a lot of people on the shore and very confident people on the sailing front to be able to take the boats out on the water, which inevitably means it’s a huge operation to go sailing. It’s really not worth it unless it’s relevant to the next Cup. That remains to be seen. The USA tri hasn’t been on the water and for a reason. In retrospect, what was the high point of the campaign for you personally? IP: For me it was six or seven months ago after Bart and Iain [Jensen] had joined the team bringing this can-do attitude coming from the Olympics, with the Olympic spirit of doing absolutely everything you can to win. They’re all great guys; I’ve known Bart all my life, Iain and Nathan more recently. We had a common kind of culture and way of working which came together as a lot of energy around the base and a lot of other good people who grew in that environment. We had found out that we were on the wrong path with the red boat so were redeveloping our boat and our wing, and getting faster and faster at putting it all together. It was a fantastic working environment and was the highlight few months. Nathan was really getting into the foils and foiling solutions, Bart and myself were taking on the aero side with the wing. We were grabbing this thing by the scruff of the neck. It wasn’t just us four—we were joined by a lot of great people—the 100 people in here were humming. It was a fantastic thing to get up in the morning and come to work. I felt things were driving at such a speed. I’ve never been in a sailing team or an America’s Cup team where everything was going at such a pace. Likewise, where did things start to go sideways for the team? IP: Like all these campaigns, it usually happens very early on with the very first few decisions that you make which are exponentially important. We failed—probably—to capitalize on some of the existing experience in the multihull world both on the water and on the shore which would have put us on a faster track to the detail and refinement stage. I wasn’t involved at that stage, so it’s not fair for me to look back and judge it. On the occasions you did sail how did it feel being on the water as a team? IP: It was great fun. Myself, Iain, Nathan—we love racing as do all the other boys on board. It was a very special moment when we crossed the line in the first race. We were almost two minutes behind, and I’ve never done that in my life, but it was the biggest victory I’ve had in almost all my sailing. I’ve never worked or felt more together as a team. I think Nathan said as we crossed that line, “We’ve done it boys,” and I think most of us had a tear roll down our cheeks as we really had done something that all of us thought was almost certainly impossible. Not impossible emotionally, but impossible practically. The thing was such a huge challenge and on top of the emotional challenge that we felt. I keep saying to people, “Those who didn’t go through that period with us inside Artemis Racing will never understand the mountain it was that we climbed." And, those words of Nathan’s as we crossed the line kind of summed it up for all of us. IP: I have a few regattas coming up, which I’m really looking forward to. 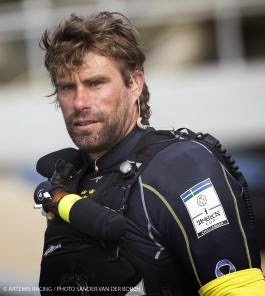 I’ll be doing my first RC44 regatta with Torbjörn. I’ll be doing the Bermuda Gold Cup with an old team representing the Andy Simpson Sailing Foundation with myself, Ben Ainslie, Christian Camp, and Matt Cornwall, which is the team of four of us that Bart would join in a five-man match-race boat and always came as our coach to Bermuda. We’re really lucky to have been sponsored by the event sponsor, The Argo Group, to donate to the charity for us to race for Bart. That’s been great for the foundation and for the four of us who were all good friends of Bart to go back to a spot where we’ve been together many times. 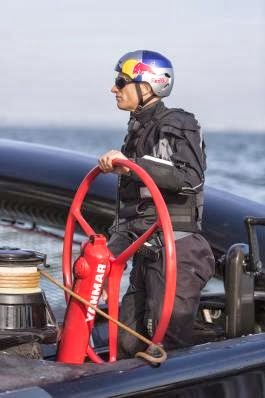 Racing is something that’s in our blood, and sometimes with the America’s Cup you get all too little of it so I’m looking forward to getting out and feeling the adrenaline of the start line again. 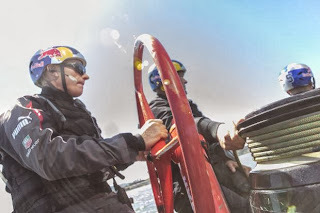 Much attention has been given to the helmsman’s wheel in this America’s Cup, particularly after foiling became the focus and the need for the helmsman to have control of the daggerboards more apparent. While ETNZ declined to share its wheel secrets, Luna Rossa and Oracle Team USA were happy to share their wheel solutions. Here Aaron Perry, a design engineer at Oracle Team USA, explains the development of his team’s current wheel design. 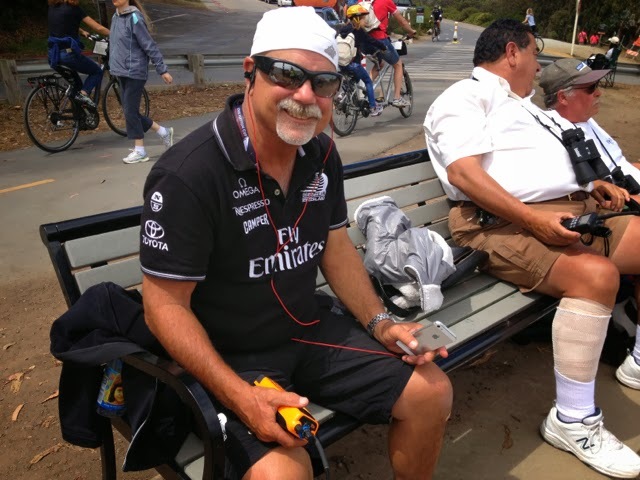 A mechanical engineer from San Diego and in his fifth Cup campaign, Perry’s focus for this event has mostly been the CAD modeling of the yacht platform, collaborating with the sailing team to design onboard systems like the steering, rudders and the wheel design. Working alongside Perry are design team members Dan Smith and Richard Kent who built the wheels, wired the electronics, and were responsible for much of the original button cartridge idea, says Perry. What are the requirements of the wheel? AP: We first launched the boat with an entirely different steering system. It was kind of a whipstaff-crossbar linkage, because the helmsman wanted to be able to push and pull on a tiller in effect. They thought that pre-start maneuvering standing while on the center pod was going to be critical. If you look at early images of our boat, it was Jimmy standing on the back of the platform steering the boat off vertical tillers linked to each rudder. We adapted that to a different tiller set up but still tried to maintain that kind of feel for the helmsman. But then we realized to get enough mechanical advantage and steering range we really had to go to a wheel where we now have adjustable sprockets and can tailor the load to different rudders that we’re using. The second big focus became trim adjustment on the daggerboards for the helmsman while foiling the boat downwind. We think the buttons on the ETNZ wheel and the wires on the Luna Rossa wheel are doing something similar—pitching the daggerboard to trim the wing beneath it while flying. So it’s a real tool for the helmsman? AP: Yes, in design meetings Jimmy often talks about similarities between flying a plane and sailing these boats, being a pilot versus a helmsman on an AC72. The wheel is acting almost like flap controls on an aeroplane wing in terms of being able to adjust the lift that you’re getting from the daggerboards. He’s actively controlling that while flying the boat with hydraulic pressure supplied by the crew on the handles. That’s another job to add to the helmsman’s already busy list while he’s driving? AP: You’re right—it’s pretty hard to pull off when you’re also concerned about sail trim, what the other boat is doing, steering the boat and flying the boat at the same time. But to Jimmy it’s second nature. What are the knob-like protusions around the wheel? AP: They each hold one button that pitches the board forward and one that pitches it aft, and we have a series of these cartridges around the wheel facing inwards. So depending on where the helmsman is in the rotation of the wheel, they’re easy to get to and he always has one close by. Luna Rossa has tensioned wires around the inside of the rim of the wheel. I believe that being able to pull on either of those two cables may trigger an internal switch to facilitate making adjustments. What sort of angle change are we talking about that the helmsman is adjusting? AP: It’s small, less than five degrees. And jibing involves not only pitching the boards but raising and lowering them at just the right time—there’s been a lot of learning. Learning how to maintain consistent lift through a turn has become a focus during practice. The helmsman is pretty screwed if the connections from those cartridges fail? AP: We’ve had that happen a few times. We have spare wheels, but any repair costs time on the water. You’ve seen how these boats sail, and there can be water just pouring over the crew, so waterproofing was critical and these small parts had to become removable from the hub so that was a little design challenge in itself—making sure the cable routing into the pedestal and into the boat was totally sealed from water. The shape of the wheel—is it designed specifically for each helmsman? AP: For sure, in fact we have our own mold for the wheel shapes and so make all our own laminates. Boatbuilder Dan Smith and electronics expert Richard Kent are responsible for many of these innovations. There’ll be no further development on the wheel you have now? AP: We’re not going to make any changes now. What do you think the Kiwis may have? AP: They used to have buttons around their wheel just like what we have. I can only speculate on what they may have going right now. It looks like they may have—which is clever—some sort of pressure-sensitive strip glued to the inside diameter of their wheels. Perhaps it’s proportional so that the harder you push on it, the faster the trim. 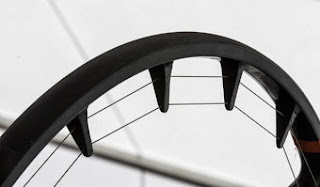 What could be the next generation of a wheel design? AP: Not sure—if ETNZ are doing what I’m speculating, that might be an improvement over what we have. But for us, I think that Jimmy likes to know that when he presses the button, he knows exactly how much adjustment he can expect. What other things are you working on in these last days? AP: We’re just doing lots of small things, trying to reduce friction where we can, trying to improve reliability. We’re not testing new equipment but looking at where things could possibly break. It’s still keeping us super busy every hour of the day, weekends ... it’ll be like that right up until the first race. With the 34th America’s Cup match racing final less than two weeks away, the anticipation is palpable—who is faster? 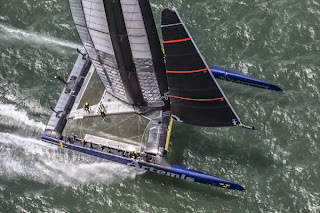 The well-seasoned Kiwis who have made so few mistakes in their conquest of the Louis Vuitton Cup, while also charming the pants off the sailing fans and spectators with their slick maneuvers and team spirit? Or will it be the Americans, who’ve had the good fortune of ample resources throughout their campaign, but who are now knee-deep in muck over allegations of cheating, which could cost them races and top crewmembers? It doesn’t seem to matter who you talk to, the answer’s the same: Race 1 will tell all. What did the challenger racing reveal to you? What did you learn? JK: ETNZ is impressive. They look really strong in their crew maneuvers. They seem to gain a lot there. We study those moves to try to learn and improve. We look at different helicopter shots and shots from on board; we study those as much as we can. Things that they’re doing well we want to learn why and try to apply that to our sailing. JK: Their jibing and their tacking. As you’ve seen, you can gain hundreds of meters in one jibe. They're very consistent out there. Probably we still have a ways to go to catch up to them in that. JK: Yeah, I think so. In some conditions our consistency isn’t quite as good as theirs at the moment. They’ve had the same group of sailors for a long time. We have a big group here. Just recently we’ve gone with more of a racing team and a back-up team, splitting that onto the two boats, so we’re still learning each day when we’re out together. That’s a little bit of a factor. I’m not saying we can’t get there, we still have up to seven more sailing days. Hopefully, we’ll do a few two-boat days also. Why wouldn’t they all be two-boat days at this stage? JK: Logistically, it’s really hard to sail, maintain, launch. It’s a major drain on the whole team to do that. Ideally, every day would be a two-boat day, but logistically it’s hard and tiring; resource-wise maintaining two boats is really hard. Maintaining one boat is really hard. We need to do it, but it’s hard. Local knowledge is your expertise. Tell us how conditions will be different in September here versus what we’ve seen in the LV Cup? JK: It’s pretty far out to predict precisely, but at this time of year, San Francisco starts to change normally. Yesterday [last day of LV Final] was a different day already. We start going into a more fall-type of pattern: lighter air with less sea breeze. The first four days of racing are going to be in a more flood-type of current, which will bring the winds down some and make it more time upwind than average and less time downwind on average than a normal slack tide. Lighter breeze and smoother water. You got to observe ETNZ in a range of conditions: lessons? JK: Only yesterday did we get to see them race in lighter air. It’s all been pretty heavy breeze, so we were happy to see them in one light race to get a feeling of our performance against theirs. The initial look is encouraging for us that way. They look really good in a stronger breeze. I would hope that we have an advantage in lighter wind. You’re more optimized for lighter breeze then? JK: Well, yes and no. Now with the lower windspeed limits plus or minus current [23 knots for the match], we’re trying to optimize within 8-20 knots [laughs] which is a pretty wide range. That’s what we’ll get during the Cup, and I’m sure that’s what the Kiwis are optimized for. I don’t think any team has a huge advantage either way—maybe we’re a little towards lighter air and they’re a little more towards the higher breeze. Have you been able to get much light air training in? JK: Not really. We haven’t really seen code zero conditions, but we’re hoping we do between now and the Cup so we can get a few training days in with the zero. There’s a really good chance we’ll see at least a few legs—it could be less than half the regatta—where you’d be using the code zero. We’re trying to use it more and get comfortable with it. The crossover for the code zero is around 10-12 knots, and anything over that you’re not on it. How do you collect and understand data from ETNZ? 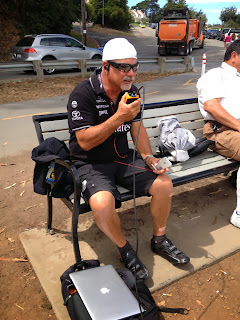 JK: The racing data is good because we have their boatspeeds and all their speeds—its GPS speeds so its over ground—then you have to calculate the current, etc. We do that ourselves and have a pretty good idea of what their performance is like through the racing. The racing’s been good to watch, as it’s harder when they’re on their own and not racing to get a really good idea of what they’re doing. Have you emulated the speeds ETNZ have reached? JK: I take some of that really lightly because I don’t have the hard facts because it might be speed over ground. I’d say what’s been broadcast over TV is speed over ground. If you’re going downwind at 40 knots, you have 3 knots of flood—there’s 43 knots right there. I’d really need more information to believe they’ve done 48 knots, but I think we’ve been close to that for a top speed. Do you have a sense whether ETNZ still have something in the bag? JK: No, I don’t think they have anything that’s big—there’s always little things, and they’ve been working on upwind foilin,g and they’ve seen us upwind foiling so it's no real surprise, but I think they’re trying to keep it quiet. I think they were a little disappointed that way back when they started foiling downwind they leaked that as quick as they did. I’ll bet they wish they’d held that closer. Now with the upwind foiling, I can tell anytime we're around them they don’t do it, they try to hide it. But it’s pretty obvious they’re doing it, and we’re doing it. I think you’ll see some of it in the race if it’s the right conditions. The text from Dee Smith reads, “The place I watch is at the top of Crissy Field. Park bench. Will be there before noon.” I text back for specifics because Crissy Field is a big place. 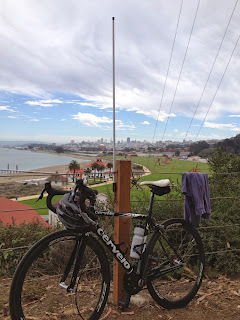 Smith replies with a text, ”Dropped pin near San Francisco Bicycle Route 2, Golden Gate National Recreation Area, San Francisco, CA 94129," and a link to a Google map. I find Smith on his perch with a bird’s eye view of the top end of the AC34 racecourse. He’s conspicuously clad in all-black Emirates Team New Zealand gear, clipless cycling shoes still on. 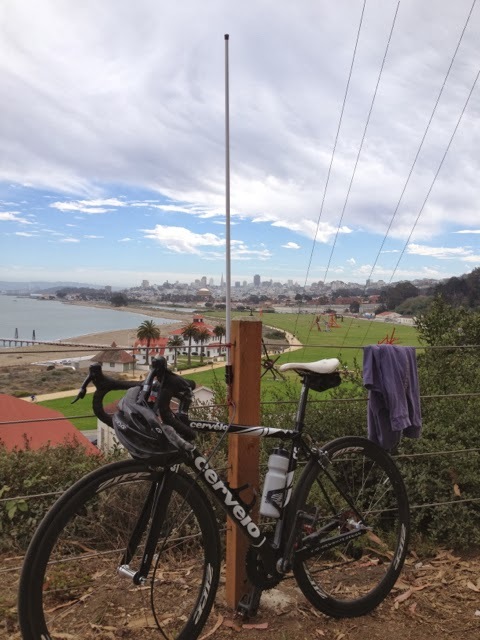 His black Cervélo road bike leans against a wire fence in front of him. 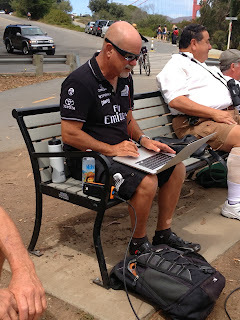 Attached to the bike is an antenna, and his laptop is powered up. He’s talking by radio to Roger “Clouds” Badham, ETNZ’s weather guy who is set up in a building that looks out over the middle and bottom end of the course, and tactician Rod Davies, who is aboard the Kiwi boat for Race 1 of the Louis Vuitton Finals against Luna Rossa. What are you doing perched out here? DS: What I am doing is just what you see—weather opps—I’m putting my tactical stuff with the weather stuff and relaying to Ray on a one-on-one basis, understanding what he wants. Clouds understands it, too, but I just have that local tactician knowledge. If I had eyes out here every time I sailed, it would make it a lot easier, especially if it’s your own eyes. Specifically, what are you doing for ETNZ? DS: In the beginning I was the local knowledge teacher, and that was to get Ray, Dean and everyone on the team up to snuff with everything I know from 40 years of sailing here. That part of the job is really over because they’re smart boys. They can figure it out; they’ve been here long enough. They’ve now asked me to come in and observe the west end because Clouds can see the east end of the course. We go through this same banter back and forth, what I see and feel and what he knows with the models. How does the info you feed back supplement what the weather models give them? DS: I don’t try to give them the information and say, “You gotta do this, or you gotta do that," because in the time lag, when he can’t get the information after the five minutes, it changes. What Clouds and I both do is we try to tell them what we see, what we think are the things to watch out for, and try to predict the future the best we can. Of course we can never be wrong because we’re not making the call. We want to him [Ray Davies] to have the information to make the call with confidence, whatever it is. It’s super light out here today—unusual for this time of year? DS: I don’t think conditions can get much lighter than this—the main thing is we have a strange weather pattern. We don’t just have this established high out there pumping in northwesterlies every day. But the boats are so powerful they can sail in anything. Today we’re wondering if we want to put a code zero on the boat today or not because in 10 knots of wind it’ll be a lot faster downwind. You know the guys at ETNZ well—what’s working for them? DS: They’re an incredibly well-run team. Everybody’s on the same page, there are no politics, everything is discussed in a way that would result in the best decision. Ideas flow through all channels, and everybody thinks about them—it’s just easy and refreshing. It’s a bit of a management style from Dalts. I went around the world with him—12 years ago—he’ll squish the politics if necessary. He just doesn’t deal with it. It’s his team, his style of management and direction. He finds really smart people and gives them the responsibility and authority to do their job well. In this big of a team it’s hard to do—like we’ve seen in another team here who hasn’t done so well. Dean is more of a pilot than a sailor. He’s a boatspeed guy—he’s taken it on and he’s got it. It’s impressive. They didn’t know what they were doing in the World Series events only because they were so busy focusing on their 72. Their foiling jibe is definitely working for them, right? DS: They’ve been doing it a lot ... they drop in, their timing is perfect, the turn is even, everybody gets there, and they’re off. It’s not hard for them, but it’s because of the countless hours of doing it, and they have more hours than everybody else. It’s got to be a huge advantage. It’s really important. What are your thoughts on ETNZ versus Oracle performance at this stage? You’ve been out on the 72—your thoughts? DS: Amazing, I was just sitting there going, “Wow," then you watch the guys sailing it. It’s not easy, but it’s not hard—they know what they are doing. Very impressive—it’s more like being a fighter pilot than a helmsman, as far as what you have to think about and do. We’re sailing in three dimensions now, it’s not two anymore. It’s so much smoother than the 45. You’re talking about speed, we’re supposed race boats—we’re finally racing something that isn’t the slowest means of transportation known to mankind for the first time [laughs].